ATCs y otras cosas: Always the Bridesmaid.. This is the second card for the Wedding Swap. I don't think my partner reads my blog, so I'm showing it. I did think about doing "the Groom", but couldn't find any suitable material lying around, and the thought of having to move things to get into the big cupboard didn't really appeal. The bag of chiffony bits was handy under the sewing room table, so I had a rummage in there and found this strip of pleated dusky rose that I think came of someone's sleeve. 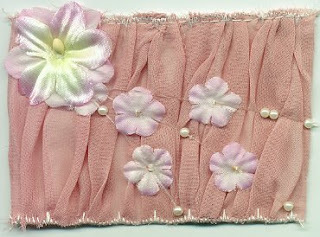 I stitched it onto a pelmet vilene backer, then added the flowers and beads. I hadn't noticed until I scanned it that I haven't removed the straight stitching along the top edge. On a technical note, I shall use the power tape method again, but next time I'll try with the sticky-back plastic used for covering books. I can cut that to size. I also might try making a mask of release paper, wetting the back of the magazine image after having put it on the tape, then rubbing the paper away, just leaving the image..I'll report back.